Steal my secrets to making amazingly fluffy biscuits completely from scratch. 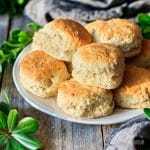 Even if you’ve never made homemade biscuits before, you can be successful with this quick and easy recipe! 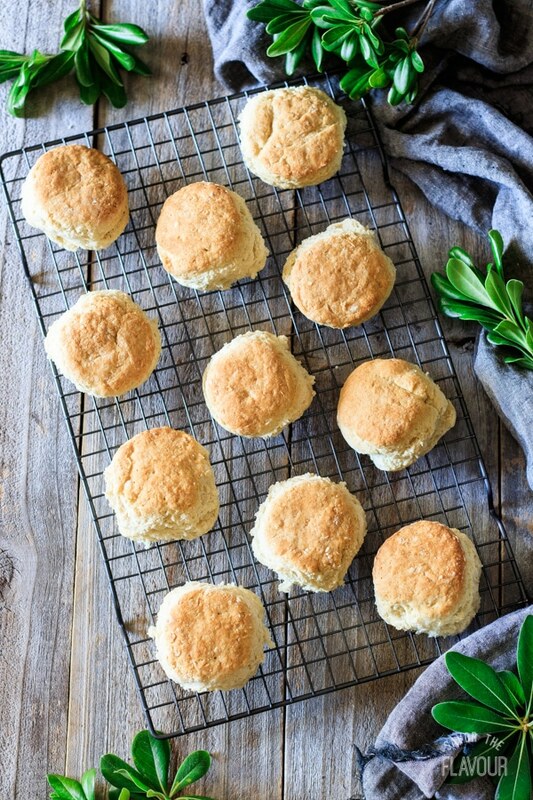 These simple biscuits are made with lard and butter for flakiness and flavor. This post was originally published on September 7, 2017. One of my favorite parts of Thanksgiving dinner is biting into a flaky homemade buttermilk biscuit. The crunchy golden crust and fluffy interior makes the whole meal so much better. 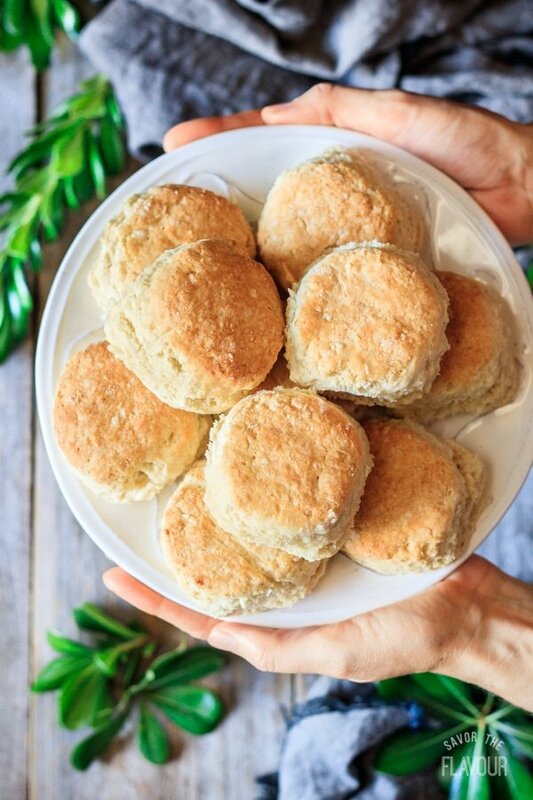 😋 But you’re asking, “How can I make perfectly flaky biscuits myself?” Don’t worry; I’ll show you how it’s done! 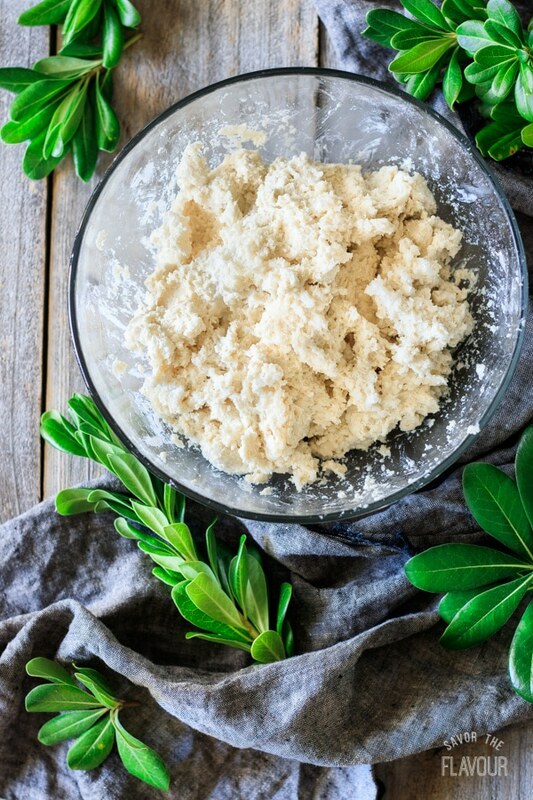 Make a buttermilk substitute by adding 1 tablespoon of lemon juice or white vinegar into a measuring cup, then pour in milk until you have 1 cup of liquid. Stir to combine and let stand for 10 minutes before using. Make sure that the butter and lard are cold. It will result in a flakier biscuit and a less greasy dough. Be careful not to overwork the dough, or the biscuits will be tough. Mix the dough until just combined, and be gentle when re-rolling the leftover scraps. Avoid twisting the biscuit cutter; just push it straight down. Twisting the cutter can seal the sides of the biscuit together, inhibiting the rise. It’s best to bake the biscuits on a baking stone instead of a cookie sheet. The baking stone conducts the heat of the oven more evenly, helping to avoid a burnt bottom. Place the biscuits with their sides just touching on the baking stone or cookie sheet. It will make the biscuits have soft sides and rise higher. 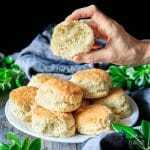 Let the biscuits sit for 10 minutes on the tray before baking to get a lighter-textured biscuit and a higher rise. 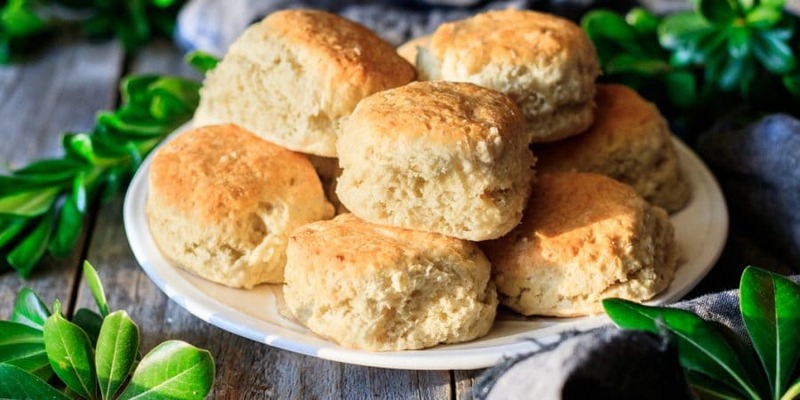 It’s important to bake the biscuits at a high temperature, ideally 450 F to 500 F. The heat encourages the biscuits to rise higher and brown more quickly. In my biscuit recipe, I use both butter and lard. Why two kinds of fat? Well, butter provides a fantastic flavor, while lard increases the flakiness. Lard and shortening create flakier biscuits because they “shorten” the gluten strands in the dough, creating a more delicate biscuit. Lard also melts at a higher temperature than butter. The slow release of steam from the melting lard improves the rise and flakiness. Why use lard then? I prefer to use lard because it’s an all-natural fat, as opposed to processed shortening. In fact, lard contains less saturated fat than butter and no trans fat, unlike shortening. 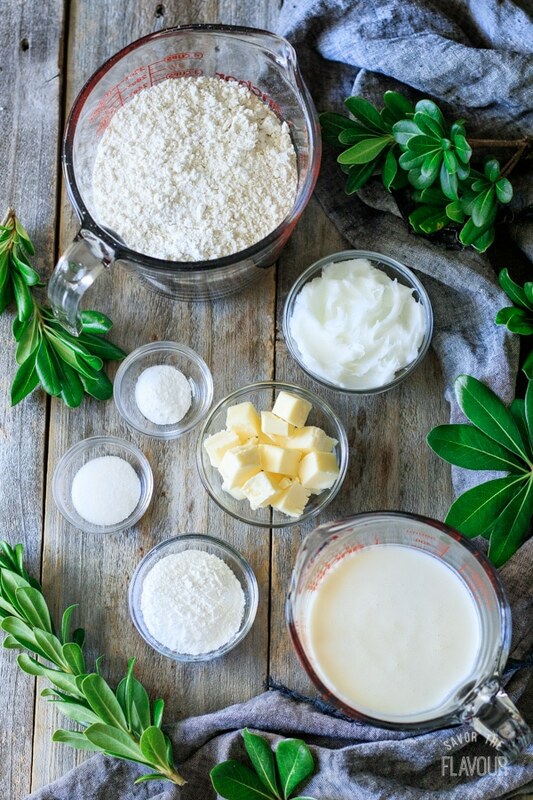 Measure out all the ingredients: all-purpose flour, baking powder, baking soda, salt, butter, lard, and buttermilk. Whisk all the dry ingredients in a mixing bowl until well blended. Add the butter and lard to the flour mixture. Pinch the cubes of fat and mix them with the flour until the mixture looks like breadcrumbs. Gradually pour in just enough buttermilk to make a sticky dough, mixing with your hand as you pour. (Yes, you’ll have sticky fingers! 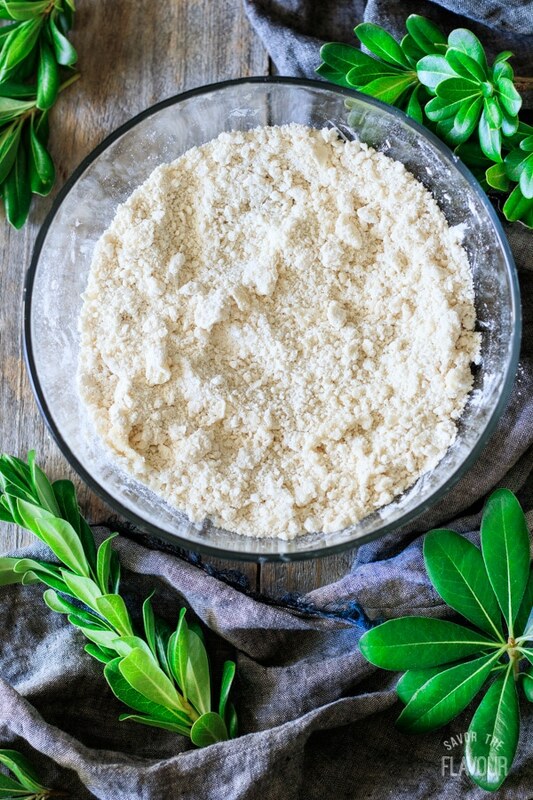 😊) Make sure to pick up all the flour from the bottom of the bowl, but don’t handle the dough more than you need to. Be gentle! Roll out the biscuit dough on a floured surface to 3/4 inch thick, then cut out the rounds with a biscuit cutter. Gently re-roll the scraps and cut more biscuits, then place them on a baking stone. 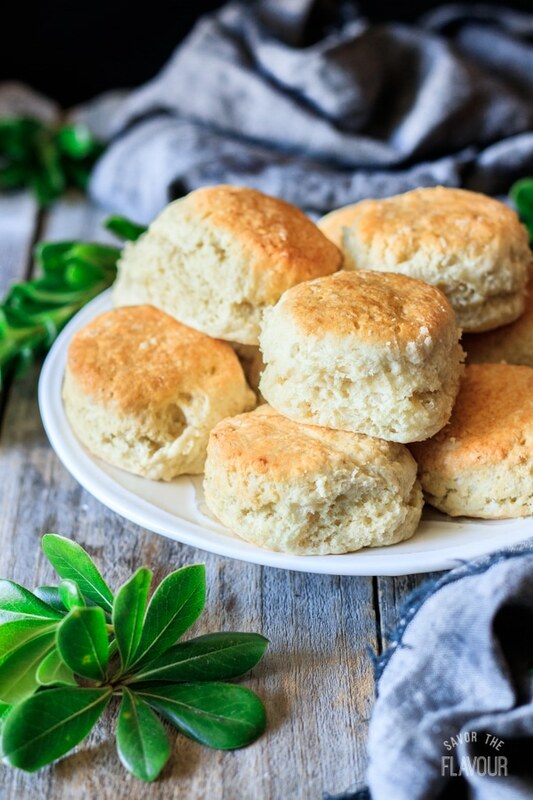 Make sure the biscuits’ sides are just touching each other, then bake them at 450 F for 15-20 minutes. They should be tall and golden on top. Let them cool on a wire rack for a few minutes, then serve. Looking for more delicious additions to your bread basket? These ones will be popular! Skillet Cornbread: this crispy, slightly sweet cornbread is ready in under an hour. Jalapeño Cheddar Cornbread Drop Biscuits: these delicious little nuggets are cheesy and spicy. 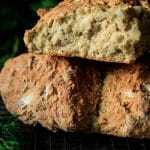 Oregano Onion Soda Bread: this moist, savory no yeast bread is so quick to make. 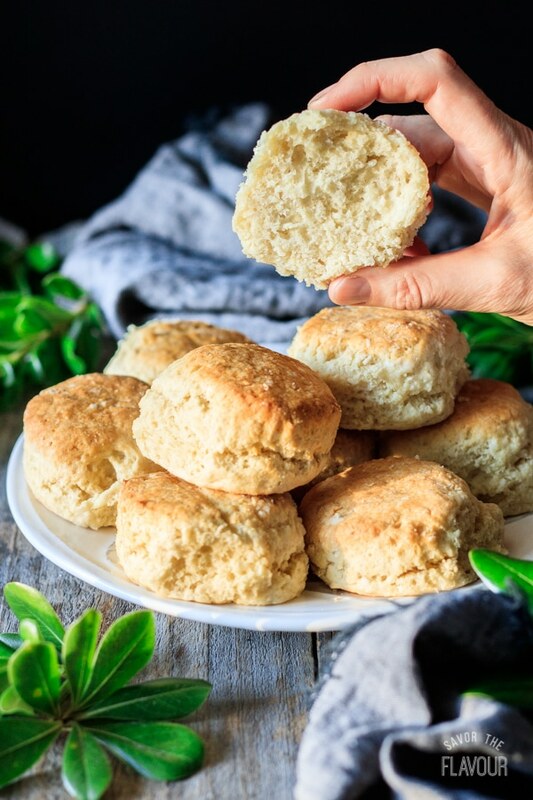 Did you make these fluffy buttermilk biscuits? We’d love to hear how you enjoyed them! 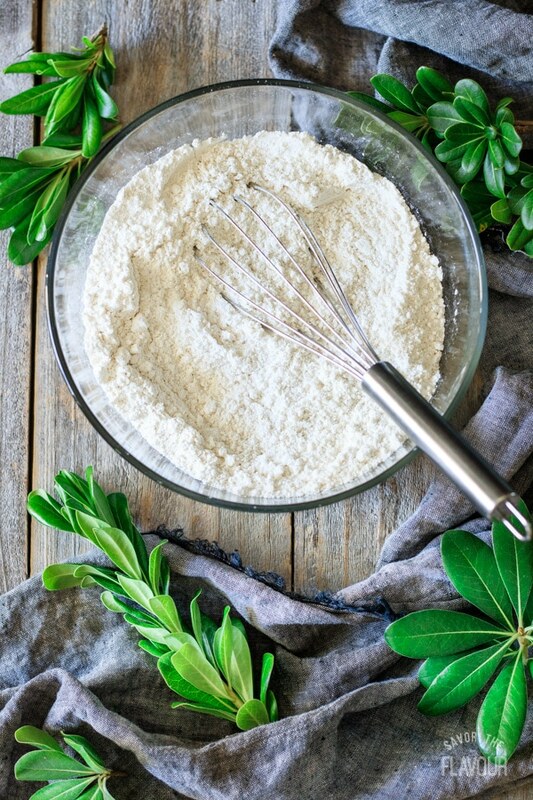 Whisk together the flour, salt, baking powder, and baking soda in a large bowl. Dump in the chilled butter and lard and rub them into the flour by pinching the chunks of fat. Stop when the mixture has a breadcrumb-like texture. Add about half of the buttermilk and stir with your hand to start bringing the dough together. Pour in the rest of the buttermilk in one or two more additions, gently working the dough until all the flour and buttermilk are incorporated and a soft, sticky dough has formed. Turn out the dough onto a floured surface, scraping out the bowl to get all the dough. Sprinkle the top of the dough liberally with flour and roll the dough to 3/4 inch thick. 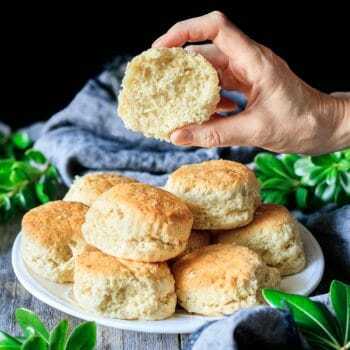 Using a 2 1/2″ round biscuit cutter dipped in flour, cut out as many biscuits as you can from the first roll. Don’t twist the cutter, as doing so will seal the sides of the biscuits together, inhibiting their rise. Gently re-roll the scraps and cut more biscuits, being careful not to overwork the dough. 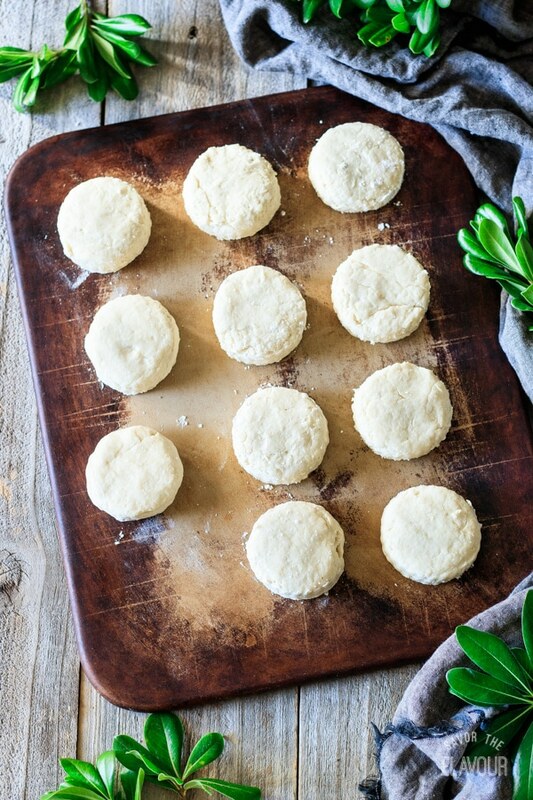 Place the biscuits with their sides touching on the baking stone or cookie sheet. Bake for 15-20 minutes at 450 F. They should be well risen and golden brown. Make sure the butter and lard are cold; it will make the biscuits flakier. Handle the dough gently to avoid having tough biscuits. Placing the biscuits with their sides touching will help them rise higher and have soft sides.